Among more than 20 people killed by Islamic militant groups are members of religious minorities, although this is believed to be the first attack on a Sufi Muslim. Sufism is popular in rural Bangladesh but considered deviant because of its mysticism by many of the country's majority Sunni Muslims. The cleric was a local leader with a small following. Police say they still do not know who killed him but it could be the work of Islamic extremists. A liberal professor was killed in the same way in the same area last month. In the most recent murders before Saturday, a Hindu tailor was killed in Tangail and a week before that leading gay rights activist Xulhaz Mannan and his friend were brutally murdered in the capital Dhaka. So-called Islamic State have said they carried out many of the attacks, but the authorities deny the group is active in the country. 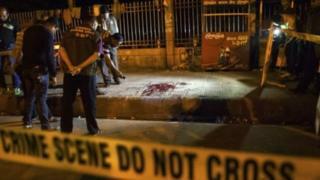 A Bangladeshi militant group affiliated to al-Qaeda, Ansar al-Islam, has also said it carried out some of the killings. The government denies it has not done enough to stop the killings and has blamed all the attacks on opposition parties or local Islamist groups. It has been strongly criticised for not being able to prevent the violence or bring perpetrators to justice. Opposition parties deny the claims. Bangladesh has myriad extremist groups and there have been few convictions.